Space City Comic Con is over. We were relatively untouched by the drama that happened over the weekend, but unfortunately couldn't avoid the rain and flooding. The convention was sparsely populated on Friday and Saturday, and it looked like the it as going to be a very disappointing weekend. Fortunately, Sunday more than made up for it, and I met a lot of friends and potential new fans. The USB wafer drives were as big of a hit as I was hoping that they would be! I have a few pictures from the con, but not nearly as many as I'd like. I spent most of my time talking to people about my books and about the writing and publishing process. I did take a lot of pics with fans after signing books, but I never thought to ask for copies...I'll try to be more on the ball next time! I'll have a whole mess of books to sign at SCCC, but I thought I'd try an experiment, too. 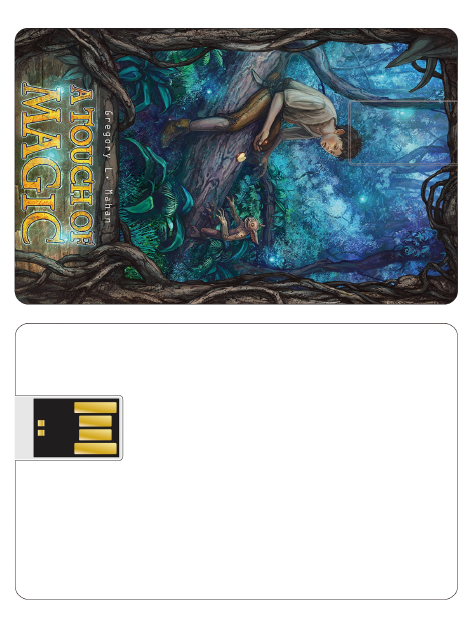 I really like the ability to get the cover onto a USB drive. I think that'd have a lot of real value for some people. And I especially like that the back is blank/white so that I can sign them, just as I would a paperback. The problem is, I'd have to sell them for $15.00 each in order to make the cost worth it. My question to you, my fans, is: Would this be something that'd be worth it to you? Please send me an email or comment on the blog post and let me know. I'd have to spend a lot of money having these things printed up if the interest at that price was really low. But, on the other hand, if people think they're as cool as I do, I would want to have them made right away, in time for the Con. My merch and advertising stuff has started to arrive. 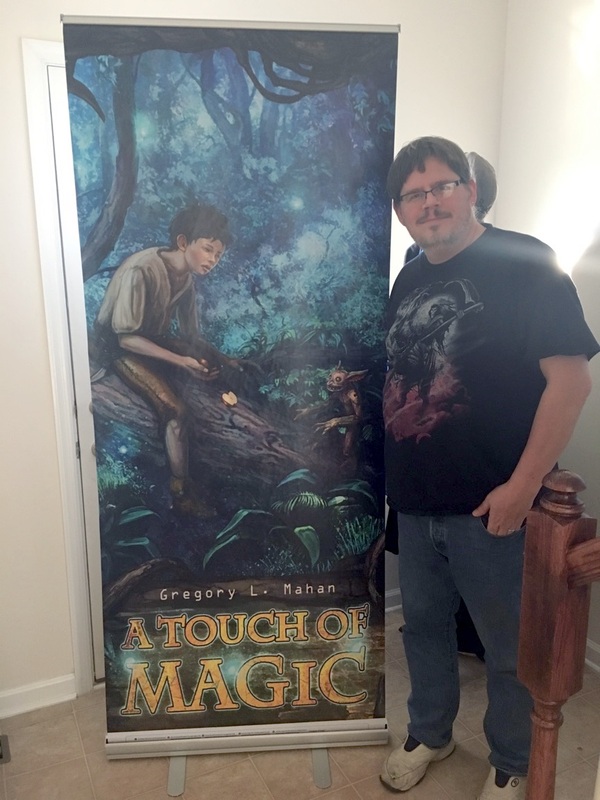 This banner is so much bigger than it seemed in my mind when I ordered it! Every year, I donate some books to Michaels for their Michaels Cares charity drive, to be auctioned off in the store where my wife works. As part of the package deal, I agree to come in, sign them, and chat with the winner. Every year, they've gone for well above retail cost, which makes me feel good about doing it, because I know the money's going to people in need. 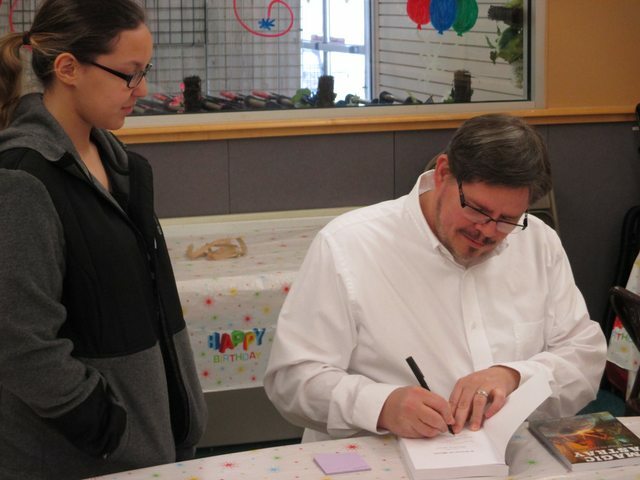 This year, the winner wanted the books to go to his daughter (shown in picture), and she was smart as a whip! For a young person, she asked very insightful questions about the writing process, publishing, etc. I must have talked to her for a good half an hour, and it was a genuine pleasure. Books ordered, Booth reserved, Texas Sales Tax permit ordered. If you're in or around the Houston area Memorial Day weekend, I'd love for you to drop by and say hi! Everything is so dang interconnected now. I'm starting to feel my age. But this is not a whine. I went to McDonalds today, because I got a free burger on their mobile app. McDonald's is running some sports-themed sweepstakes/contest. I got a 15% off coupon to the NFL store.